Idlys are a south Indian treat – steamed rice cakes which are soft and chewy and perfect dipped in a flavoursome curry. Traditionally they’re eaten for breakfast, and this is a good time to get them as they can sometimes sit around in the sun all day. They’re another one of these foods which is so hard to make at home, but super cheap and delicious from a street stall with a spicy sauce thrown in for free (about three for $1). Somewhere in the maze of backstreets which run west of the river. Varanasai. I was quite into brains until I ate this. Previous good experiences of fried brains in Slavic countries had me looking forward to the curried version. But alas, the texture does not translate. It wasn’t horrible – in fact the delicate spices of the curry more or less pervaded everything, so in many ways it doesn’t really matter what you curry because it all tastes the same. But the texture, the texture. Not the worse thing ever, but just that wrong combination of soft and also unyielding. The kind of consistency that makes your brain go: what the hell is THAT? Taste-wise, kind of fatty, but OK. I’ll be honest I didn’t finish it but bagged it up and gave it over to a pair of men on the street who on reflection might not have been actually homeless, and may also have been vegetarians. 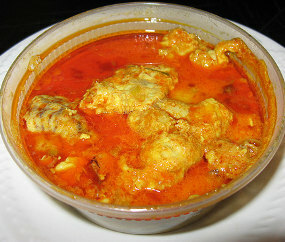 You can get brain curry mostly in north India where they’re more carnivorous. This particular dish was enjoyed in one of the classier restaurants in Jaipur. 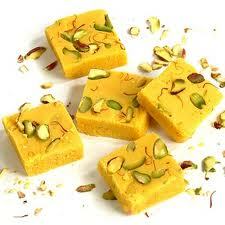 Indian sweets are a ‘love it or hate it’ kind of thing. For a lot of people they’re a bit sugary and fatty. And most of them are made by boiling milk to a paste and adding sugar and cardamom so they can have slightly sour milk overtones. 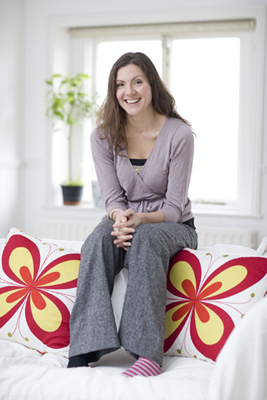 I was lucky to have the kind of parent who made the idea of Indian sweets incredibly exciting for me from a young age, so I think they have a kind of magic about them – all those bright colours and silver paper and crispy towers of orange jalebi. 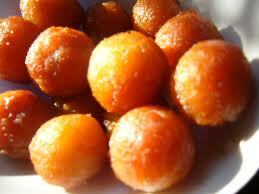 My favourites are gulab jamun which is like a reverse doughnut. It’s a deep fried dough ball soaked in syrup so the oozy sweet stuff is on the outside. 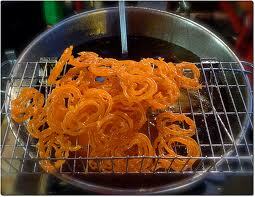 Also jalebi (or jelebi) which is crispy coils of batter deep fried and then soaked in a bright orange rose-flavoured syrup. The rest of the barfi range is more like milky fudge with moderately different colours, and if you’re lucky, the odd bit of silver leaf. Kolkatta (Calcutta) is the place to go for sweets, although Delhi also has an amazing big sweet shop on Connaught place which will wrap them up beautifully. There is such a difference between the fresh and stale sweets that it’s really worth seeking out a shop which makes them daily. About a quarter pound of sweets costs about $1. I feel a bit guilty admitting this is probably the best thing I had to eat in India – and that’s from a big selection of good food. The reason for the guilt is that I saw the way animals were kept in India, and it really should have been enough to keep me vegetarian for the duration. Quite aside from the man selling chickens in Darjeeling who sat upending bird in a jug of water until their legs stopped moving, the way meat is displayed should also be a warning sign. Often left unrefrigerated on open stalls and covered in flies, if anything is going to upset your stomach in India, this would be it. But something about the koti roll stall smelled so delicious every time I passed it that I eventually gave in, and am very glad I did. 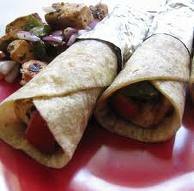 The koti roll is a bit like a shawarma in principle – grilled meat wrapped in bread. But the India version uses a paratha rather than a pitta bread. Parathas are freshly made to order by spreading a round of dough on a hot griddle, smearing it with ghee, folding, it turning it, and repeating the process. The result is the flakiest butter bread and hot from the grill is beyond delicious. Spread with a spiced raita yogurt, and filled with hot chicken it takes on a new dimension all together. And yes I did get moderately ill (I think) from eating it. But for the record, it was worth it. I defy anyone to go to India and not get totally addicted to thalis. The thing that always really blows me away is that they’re one of those dishes which is meat-free but it would never occur to you to notice as there’s so much flavour going on. Thalis are traditionally the choice of sad bachelors who don’t have wives to make them the lunch-time tiffin tin filled with delicacies made with love. Tiffin-wallahs ferry the containers from homes to offices every day and it’s great to watch them racing through Mumbai with them loaded on their heads. Anyway, standard procedure for thali is this. You go in to some grubby-looking hole in the wall place filled to bursting with young men scarfing down as much food as possible. Almost as soon as you sit down the thali tray arrives – five or so different curries, pickles and yoghurt choices arranged in little pots around a great mound of rice. 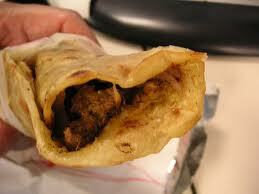 Chapatti is also a staple, and if you’re in a slightly upmarket place you might also get a naan bread. Delve in with your fingers, and as soon as you run out of any of the little pots it is instantly refilled by a waiter. The rice and bread is finite but everything else is all you can eat so fill fill fill. Something about all those different flavours prompts you to eat more than you ever thought possible, and as the price is rarely more than $4 it’s probably the best value all-you-can-eat in the world. You find thalis literally everywhere in India, but my best one was on the same street as Leopalds in Mumbai, heading west. Masala dosas are one of the many Indian foods that you wonder why you don’t see more outside the country. They’re essentially a mammoth potato flour pancake, straight from the hot plate and folded in two, but still managing to take up the space of three plates. In the middle you get a generous splat of curried potatoes, and most places then pour over a spiced gravy. They’re served in the Indian tradition of using communal tin plates which get a cursory wipe with a dirty cloth before being refilled for the next customer. From my point of view this is probably what makes a lot of people not used to Indian street-food ill, as they’re washed in untreated water. Not to mention being passed back and forth between various hands and mouths without any detergent. 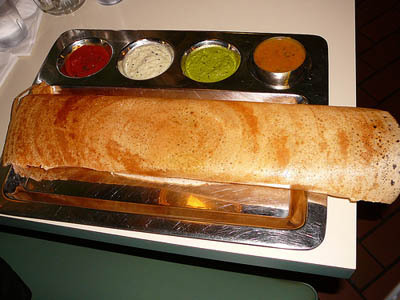 For this reason a masala dosa is a great choice as the big pancake keeps the wetter food from contact with the plate. More importantly they are enormously delicious, super cheap and almost impossible to make at home unless you’re prepared to put in the years of practice of a professional dosa flipper. For around $1 it’s a great big filling meal which you’re not going to find widely made in any other country. This stall was down at atmospheric little backstreet in Calcutta which is not technically south, but you see dosas all over the country.